A Mother displays a placard during a rally outside the Department of Health to protest the administration of the anti-Dengue vaccine Dengvaxia which was developed by Sanofi Pasteur, Feb. 7, 2018, in Manila, Philippines. A faulty dengue fever vaccine has set off mass panic over immunization shots and a political storm in the Philippines following the deaths of three children. 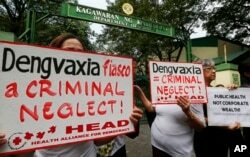 The dengue fever vaccine Dengvaxia poses health risks to more than 700,000 schoolchildren who were inoculated, the Philippine House of Representatives public affairs bureau said Monday as it opened hearings on the issue. The mosquito-borne disease has killed three children despite use of the vaccine, which the government ultimately banned, media outlets in the Southeast Asian country say. Manila also has asked French vaccine manufacturer Sanofi Pasteur for a refund. Ex-president Benigno Aquino, whose government approved the 3.5 billion-peso ($67,000) purchase that took place half a year before he stepped down due to term limits in June 2016, attended a congressional hearing Monday along with former budget and health secretaries. Filipinos have quit vaccinating their children until they get clearer information about what happened, said Renato Reyes, secretary general of the Manila-based Bagong Alyansang Makabaya alliance of social causes. “It’s a serious issue, given that kids who had no previous experience with dengue may develop a severe form of dengue if they get infected now after the vaccination,” Reyes said. “It has become a great cause of concern, so much so that one of the unintended consequences of the whole issue is there’s been a drop in people availing themselves of the vaccination program, because there’s like fear that all kinds of vaccine, not just the dengue vaccination, will have adverse effects on children,” he said. People feel confused because “no single government report or finding” has given consistent guidance, Reyes said. Aquino’s government ordered vaccines from Sanofi Pasteur after his country took part with nine others in 2014 clinical studies. The manufacturer said in November that people never before infected by dengue faced higher risk of contracting it after taking the vaccination, CNN Philippines reported. The World Health Organization also warned in December that people who have never been infected should avoid Denguevaxia. That month, current President Rodrigo Duterte’s health secretary ordered the vaccinations to stop and remaining stocks returned to the pharmaceutical company. Sanofi Pasteur has refused to refund money for used vaccinations, domestic news website Inquirer.net said last week. Sanofi Pasteur said in a statement for this report that people aged 9 years and older have a lower risk of hospitalization due to dengue, if vaccinated, compared to people of the same age without a vaccination. "Sanofi Pasteur stands behind the quality, safety, and the overall public health benefit of the vaccine to reduce overall dengue burden in these populations," the statement says. Filipinos are “correct” to demand that the Aquino government be accountable and that Sanofi give a refund, said Maria Ela Atienza, political science professor at University of the Philippines Diliman. FILE - A Manila Health officer puts back into a refrigerated storage, boxes of the anti-dengue vaccine Dengvaxia after being recalled from local government health centers. Statements from the Philippine Public Attorney’s Office have sown some of the panic among common people, she said, but it's not clear how much information the office has. Dozens have fallen dangerously ill since taking the vaccination, Philippine media say. “They really need expertise, so these government agencies must work together to determine if the children who died, that their deaths are actually results of being injected with the vaccine,” Atienza said. Dengue is common in the Philippines as well as much of tropical Asia. About 96 million people get sick with the virus. They normally show intense flu-like symptoms before recovery. Vaccinations are free for many Filipino schoolchildren, but the Denguevaxia case has made parents fear shots for any disease, said Rhona Canoy, president of International School Cagayan de Oro in the southern Philippines. Health and education officials are working together to monitor “thousands” of students who took Dengvaxia, the office of current president Rodrigo Dutere said on its website in December. “We call on all citizens not to spread information that may cause undue alarm,” the presidential website added. 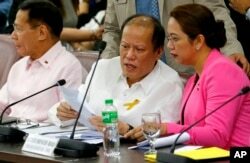 Former Philippine President Benigno Aquino III, center, confers with former Health Secretary Janet Garin as they both testify in a separate Lower House probe on the controversial anti-Dengue vaccine Dengvaxia, Feb. 26, 2018 in suburban Quezon city northeast of Manila, Philippines. Legislators are probing whether former officials misused public money to get the vaccines. The lower house’s committees on good government and health on Monday raised what they call a “technical malversation case” against Aquino. That type of case refers to officials who use public funds for expenses other than those originally covered by law, the house’s public affairs bureau said Monday. Aquino made a name over his six-year term for standing up to China over competing maritime sovereignty claims and raising the budget for public infrastructure. Aquino rushed the vaccine order to prove in an election year that he had taken a tough stand against dengue fever, said Dexter Feliciano, a Filipino voter who runs a legal startup in Metro Manila. Funding for the vaccination program came from the Miscellaneous Personnel Benefits Fund and Pension Gratuity Fund savings, the congressional statement said. Legislators want to know about “the legality of the procurement process and use of public funds relative to the school-based dengue immunization program…as well as the efficacy and safety of the vaccine procured,” it said. Aquino said Monday he had done all he could to fight dengue fever in his term based on advice from experts, the statement said. Former health secretary Janette Garin has filed a libel lawsuit against her successor, Paulyn Jean Ubial, over being blamed for the vaccination scandal, the health department website says.